Then jatayu had narrated this story. He said that he was the grandson of sage Kashyap and his father Arun was the charioteer of the sun god Surya. He had also told them how his elder brother Sapati had burnt his wings while trying to save him from soaring towards the sun. He had come to the forest of Panchavati where he was entrusted with the kingship of the vultures. 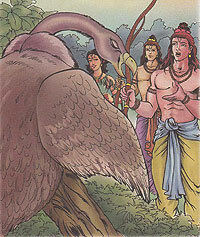 Jatayu had promised Rama that he would protect them with all his might.